The Corner Tea Stall: Global Patriotism: Answer to terrorism ? Global Patriotism: Answer to terrorism ? Before you start to stop reading this article in between its ends and amateurly blame me for being a communist, I must clearly tell you I do not support, hard-heartily, native land for minorities (...khalistan, gorkhaland or for that matter any other land). In fact I am a supporter of India-Pak, South-Asian or even global unification. Now the topic. The article is about why i should be patriotic? Patriotic to my country, specifically? Is it simply because I was born here (...and all the resources I have consumed have been provided by India, is hence what you want to imply?). But, my problem is that , I can exactly say the same last statement for Punjab, where i grew up and hence consumed resources. I have feelings, die hard, referring to my to my love for my land. ...So why should I not be more patriotic towards Punjab rather than India as a whole? and hence act for my community alone? Now, I know, the argument you will present is that, because I also consumed resources which came from many states in India (i.e, were being moved from other parts of the country). My answer is, then i should be patriotic towards Asia too! Because the last paragraph refers to what is called trade. And we trade with other countries too. So by last argument i should be patriotic to all those countries whom i trade with. Or so, i should rather , by the above argument on the contrary, be more patriotic towards my family. And i can say that its a kind of trade that my house does with the world!!? Hence, I propose, to end all this confusion, what you can call 'global patriotism'. It actually works top-down and not outwards. What I mean is , that our prime patriotism should be towards humanity (...or life forms), then to the globe, and then maybe to smaller parts such as my country or state. We should hence be a little logical in understanding the above fact, which in modern India is marred by feeling of negligence and revenge. Hence, we should all work for higher topics. You know. Higher enemies facing life, humanist topics, global issues dealing with the shackles of basic necessities of one's survival. 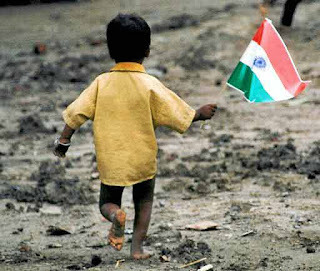 PS: And for the irony folks, today is India's Republic Day. Happy day. We..the people of India. Heh!